The following list of descriptions gives some of the characteristics, and heights of the plants grown in our location. Please note that the area of the country and growing conditions such as soil type & pH, temperature, humidity, amount of sunlight, fertilizing practices, amount of water and drainage will effect the size and health of your plants. Follow growing instructions carefully to get them off to a good start. Early care and frequent nutrition produce the best results for your plants and the most satisfaction to you, our customers. AEAE - (waiting list only) A beautiful variegated green & white plant that also has multicolored fruit. 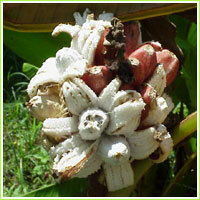 Usually cooked as a plantain, some also eat it very ripe as a out of hand fruit. Ht. 12-16ft. AFRICAN RHINOHORN - Height 10-12 feet. An unusual plantain that produces relatively few fruit but the size of each can weigh 2-3 pounds and be as long as 12-20 inches or more. The pseudostem has a dark burgundy hue which gives rise to the term some call "African Red". A collectors delight, especially when fruiting. Cold sensitive. 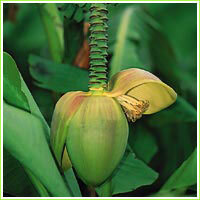 BACCARII— Ornamental banana that grows about 6-8 ft tall. Narrow light green leaves, with a bright orange/red torch inflorescence with green tips. Stunning! 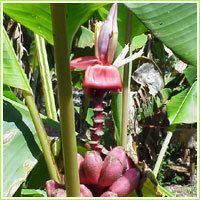 BALBISIANA - The second of the primitive seeded varieties thought to be an ancestor to many modern day bananas and plantains. 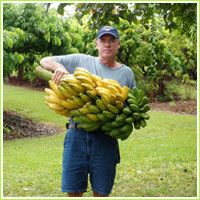 This hardy banana makes a nice landscape and collector variety. Height about 14-16 ft.
BASJOO - This cool tolerant, seeded variety grows about 12 ft. tall, is solid light green and is a fast growing sturdy plant. It frequently sends out rhizomes 2-3 feet away from the corm. It has a golden-cream colored ovate inflorescence making it a very attractive acquisition. Becoming more popular in cooler regions for a tropical appearance. 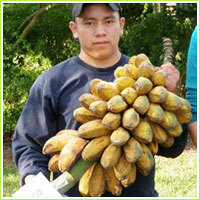 BRAZILIAN - In our opinion, one of the hardiest of the dessert bananas. The height varies on these varieties, may grow from 9ft - 14ft depending on growing conditions. Hardy and attractive plant. CAVENDISH - Dwarf (5 ft.) varieties produce wonderful tasting fruit as does the others in the Cavendish sub-group. A vigorous grower with wide green leaves. One of the more common and popular growing varieties in the USA. NAMWA - Also known as pisang awak and other names through out the world, this group of lady finger bananas produce large sized bunches of sweet, truly delicious, fruit that is prized in Indonesia and all over the world. Usually grows about 9-10 ft although may grow a little taller. DWARF ORINOCO - Named from the region in South America near the Orinoco river where they grow profusely, they are also called the horse banana or "burro". These angulated cooking bananas are also a tasty treat out of hand when fully ripe. Their versatility make them popular in many regions of the world. Height 5-6 ft. dwarf & 12-14 ft. on the tall. DWARF & RED TALL - Known by many names in the world, (Cuban Red, Jamaican Red, Colorado, Indio, Macaboo) this very sweet lady finger fruit is most beautiful. It turns "sunset" colors when ripening from dark burgundy to orange, yellow-green and muted colors in between. The full bodied flavor and distinctive sweetness makes it worth the wait of 24 months or more to give fruit. 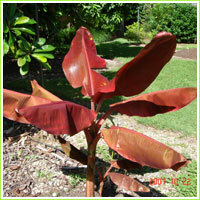 The tall red, with a dark maroon pseudostem can grow 14-16 ft, the Dwarf version grows about 8-9 ft in our area. The Red Tall and Dwarf Red are the same except for heights. DOUBLE - This beautiful Cavendish type has very wide, dark green leaves and produces a full sized fruit. 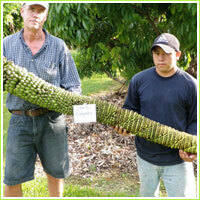 Also called the Mahoi, the second generation produces multiple bunches of fruit, usually 2 but sometimes more. 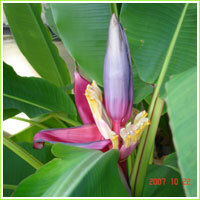 Height 5-6 ft.
ENSETE MAURELII- Beautiful ornamental banana-like plant with very large upward extending leaves. Burgundy coloration in the leaves and midribs that can vary, like the heights, depending on light and other growing conditions. Usually propagated by seed, rather than rhizomes, which are very rare. GOLDFINGER (FHIA-1) - A rapid growing, mostly green plant producing a wonderful tasting, slightly sub-acid, refreshing fruit that gets 6-8 inches long or better. It is a very disease resistant, wind & cool tolerant plant that is easy to grow. In our area the ripening fruit does not get dark yellow, instead gives only a slight color change when mature so check it often when close to harvesting. Height 10-12 ft. This one is a MUST. FHIA-02 - Like the FHIA 01 this is bred to be hardy and resistant. The flavor is mild, sweet and very pleasant. One of our favorite grows about 10-12 feet tall. Also known as the Mona Lisa which gives a hint to the subtle beauty of the plant and taste of the fruit. FHIA-03 - Another strong plant, specially bread for hardiness. The fruit is firm and refreshing with a hint of lemon. Can be cooked green or eaten fresh when fully ripe. Delicious! Grows about 12 feet tall with stout pseudostem. FHIA 18 - Desert hybrid growing about 12 ft. Strong, resilient plant, producing large racemes of a sweet fruit having a sub-acid (apple-like) after taste. FHIA 23 - A strong, cool tolerant, disease resistant hybrid that produces one of the nicest tasting fruits, in my opinion, of the FHIA collection. Sweet & fruity. 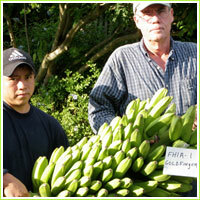 FHIA 25 - A Robust, resistant hybrid that produces very large bunches of full sized fruit that ripens very fast. For this reason many like to use it as a vegetable and boil the green fruit, which make a wonderful alternative for potatoes. 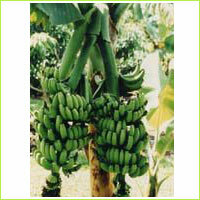 GOLDEN AROMATIC - A Cavendish type sweet banana that has a fragrant aroma and gold ripe fruit. The full sized fruit produced from this wide leaved plant is a real taste treat. Height 10-12 ft.
GRAND NAIN - The commercial variety that you can buy in the grocery store. The purchased ones are good but when you grow it yourself and see how delicious this banana can taste you wonder what took you so long to try. These full sized fruit ripen rapidly, so be ready. They can give 40-60 pounds of fruit with ease. Height 6-8 ft.
GRAND NAIN-X-SUMATANA - (We just call it the "X") It has beautiful large leaves with maroon under side and splotched maroon and green on the top side of the leaves. Resembles the Zebrina except larger leaves and fuller. 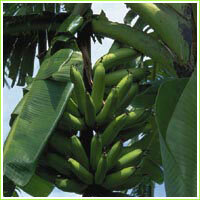 Height @ 6 ft.
HUAMOA - A Polynesian cooking banana that is almost rectangular in shape and packed with flavor. 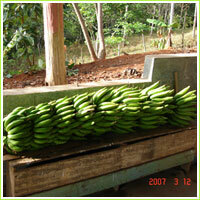 These make wonderful tostones as well as other banana recipes. The large full leaves and fat, rounded fruit make this a great looking plant. Height about 12 ft.
ICE CREAM - A very beautiful, cool tolerant plant that produces a blue/green fruit with pure white flesh. The sweet creamy fruit is very delightful. Height 10-12 ft.
KANDRIAN - A large growing sturdy plant with great flavor, dense spicy and sweet. Produces large bunches and has a huge base. KRU - Brought into this country from New Guinea, this wine colored plant gives fruit with green & red markings that narrows to a point on one end giving it an interesting and beautiful appearance. The fruit must be eaten very ripe to get full flavor. Grows about 12 ft. tall. LACATAN - Lakatan are one of the Cavendish sub-group and produce a similar fruit in shape, texture and flavor. Produce good sized bunches of fruit that has delicious flavor. Height 14+ft. 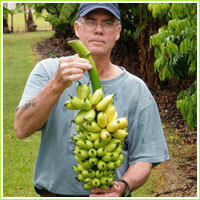 MONKEY FINGER - A terrific looking plant that produces very large bunches of long thin bananas with slight curving. It truly resembles the elongated fingers of a large monkey hand and hence obtained its name. The fruit is firm and sub-acid sweet giving it a very refreshing flavor. 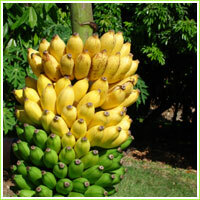 Height 10-12 ft.
MYSORE - (Height 14-16 ft.) the most popular and delicious lady finger bananas we have tasted. 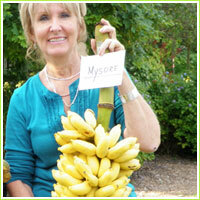 The Mysore, from India is an important commercial crop for that area of the world. 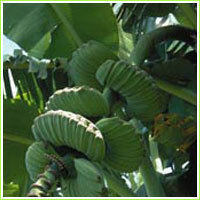 MUSELLA LASIOCARPA - This short, stout, ornamental banana like plant is a prolific grower with tight clustering leaves. It produces a golden-yellow inflorescence emerging from the center & extending upward like a crowned jewel. Flower lasts about a month. Beautiful and Unusual. Approx. 4 ft. tall. 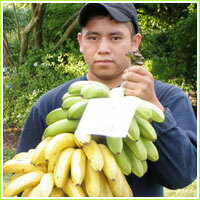 NINO - This delicate sweet, thin skinned baby banana produces a fruit about 4 inches long. It is a light green plant that grows to about 8-10 ft.
ORNAMENTALS - ORNATAS- Some flowering colorful beauties that are a bold addition to landscape and gardens. 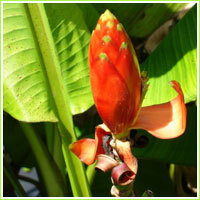 The erect flower extends upward through the lush greenery and peeps out with color. We carry the Bronze, also called Laterita, Dusky Rose, Magenta, Pink Ornata & Yellow at this time. All magnificent. Cold sensitive. Heights about 5-7 ft.
PELIPITA - A dark green plant that grows about 10-12 ft. tall and produces a cooking banana that is angulated in shape. It is a hardy plant resistant to disease which is why it is used as a progenitor for many other hybrids. PITOGO - A wonderfully different looking fruit that resembles a fig more than a banana. Its ping-pong ball looking fruit is as delicious as it is unusual. We can't keep enough ahead of the demand. A real conversation piece as well as a special treat. Grows about 10-12 ft. in height. PRAYING HANDS - Now here is a real eye popper. The fruit is fused together making each hand look like a baseball mit or hands in the praying pose. 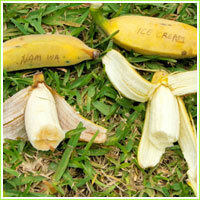 When completely ripe it is possible to separate the fingers to reveal a great tasting vanilla flavored banana. A must for the real banana enthusiast. 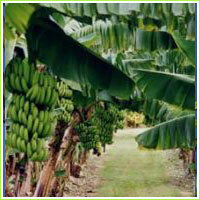 Height 12-14 ft.
PISANG RAJA - A wonderful Indian variety with a yellow-orange flesh and sweet delectable flavor. Once you have tasted this baby you're hooked on this 14 ft. delicacy. Firm and delectable with an unforgettable taste. RAJA PURI - A very popular sturdy plant originating in India and becoming a favorite around the world. Due to the rapid growth and delicious taste of these 3/4 size fruit as well as cool tolerance they have won the hearts (and taste buds) of thousands. RED IHOLENA - This versatile variety is not only decorative, with the under side of the leaves a burgundy color, but also used for eating fresh, dehydrating and for cooking. Others in the Hilahila sub group of Polynesian cooking bananas include the WHITE IHOLENA & HA'A (NOT AVAILABLE AT THIS TIME) that produce fruit that are yellowish from the onset, making it difficult to determine when to harvest. These are devoid of the burgundy coloration but produce the same fruit. All are excellent for a multitude of uses. Heights: Red 10-12 ft, White 8-10 ft.
ROSE - One of our latest acquisitions and a real beauty. The slender pseudostem displays a soft reddish color and grows rapidly. The small fruit are very sweet and delicate. Resistant to fusarium wilt, grows 6-8 ft. tall. 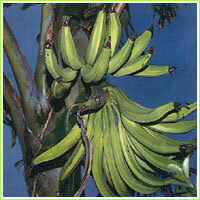 SUPER DWARF - A real midget banana growing about 3 ft. tall with wide leaves and green coloration. It produces a small bunch of medium - large fruit. Great for containerized growing or small spots in the yard or garden. A real cutie. SH 3640 - Another FHIA Research Station hybrid. A dessert type, producing a sweet, creamy full sized fruit. Grows about 12 ft. tall. Grows rapidly, fruits early. This one has real potential!! SIAM RUBY * - A new member to our collection. With it's beautiful RED leaves, (top & bottom) that vary in brightness depending on the amount of sun it gets. Great for that splash of color in the landscape Primarily an ornamental variety and is cold sensitive. Has tiny inedible fruit. grows about 6-8 ft. TEXTILES - Also known as the Abaca and Giant Pisang is a seeded variety that is used primarily for its fiber in the Philippines for making hemp rope. It is disease resistant, grows about 16 ft. in the US & has a beautiful golden inflorescence. THAI BLACK **** - Our newest acquisition and a real beauty! It has a polished looking purple-black pseudostem. Appears to be a rapid grower and can get some good height at about 12-14 ft. Produces a moderate bunch of colorful seeded fruit. One thing is certain. They are gorgeous! VELUTINA - This small ornamental, 3-6 ft. is a gorgeous thin leaved green plant that produces a small, hot pink, fuzzy banana that stands erect (australimusa). When it is mature it peals itself back exposing a white seeded fruit just ready for the plucking. Use care if eating, the seeds are like a buckshot and could easily chip a tooth. WILLIAMS - A Cavendish type that produces a full sized fruit with excellent flavor. An all 'round favorite. Grows about 8-10 ft. in height. A popular variety for good reasons. 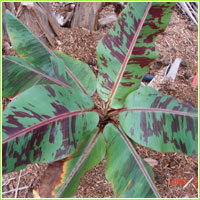 ZEBRINA - Also called the Sumatrana, Blood (and sometimes the Rojo, although incorrectly) This ornamental maroon & green variegated leaf banana produces a very tiny dark maroon seeded fruit that is cute to look at but not edible. It adds a little color to all tropical landscape. Is especially nice around decks & pools. Height 6-8 ft. Although our plants vary in size, you can be assured they are larger and stronger than other companies that use production-line selections. We strive to give you the best possible plant material and guidance for maintaining your new acquisitions. 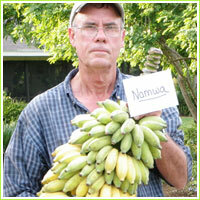 Call or email with questions, concerns or progress reports on your banana plant collection. Growing instructions are provided with your order. If followed you can enjoy the fruits of your labor in about 14-24 months from planting (in warm areas). We guarantee our plants and will replace any that fail to grow as long as growing instructions are followed (limited number of replacements allowed) You pay for only shipping & handling. If not satisfied with your order on arrival, return within 24 hours of delivery and we replace or refund the amount.